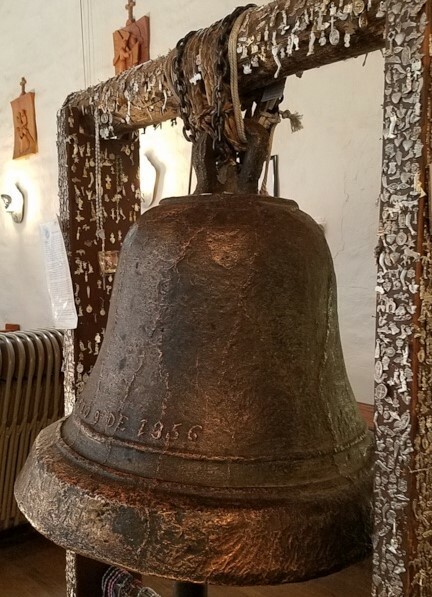 Unlike the Liberty Bell, which was commissioned in 1752 and was badly cracked by its own clapper in the early 1800s, the San José Bell is said to have been commissioned in 1356 and was virtually unscathed when it crashed 50 feet to the ground in 1872. How were they different? It’s all about the metal alloy a bell is made of — with maybe a little bit of miracle in the mix. Typically the metal used in bell-casting is an alloy containing roughly a 75/25% ratio of copper to tin. (This is a much higher tin component than that used in statuary bronze, for example.) So we were amazed to learn that the San José Bell is 98% copper and 0.5% tin! And among the remaining components are silver and a trace amount of gold. Legend has it that the silver and gold added to the melting pot during the casting process is what gave the bell its legendary protective powers and what makes the sound of the San José Bell so mellow. In the mid 1300’s, Christians were losing the fight against the Moors in Andalucia. Desperate, they vowed to cast a bell in the name of St. Joseph if he would help them win the war. So the people came, bringing whatever metal objects they had — including silver and gold — to throw into the melting pot so that the “miracle” bell might be made. 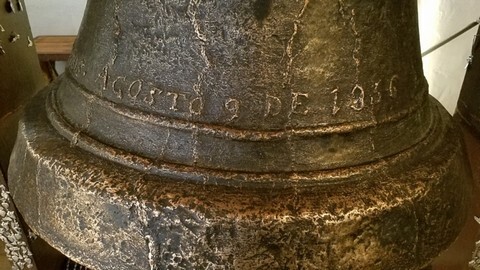 An inscription on the 780 pound bell reads “San José, ruega por nosotros — Agosto 9 de 1356” (St. Joseph pray for us — August 9 of 1356). In the end, the Christians did prevail, and the Moors were driven out of Spain. 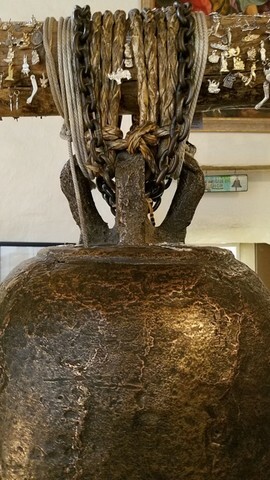 The bell was later brought to the New World by Franciscan padres, perhaps with the expectation that its powers would facilitate their efforts to convert the indigenous people. 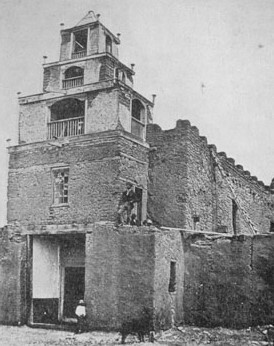 Later, the Ortiz family had the bell installed in the new three-tier tower at San Miguel — whence it sounded its seraphic tones for only 24 years before a severe storm brought the heavy bell down. But, it would seem, another miracle saved the bell from destruction! 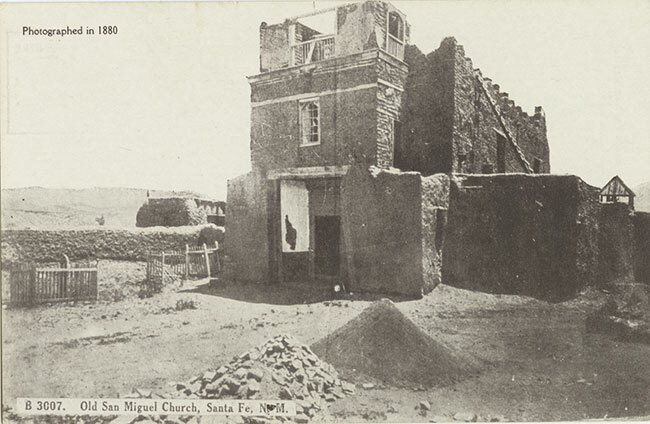 The virtually unscathed bell remained on the ground in front of San Miguel for years. It was finally brought inside where it is now displayed, suspended from a sturdy wooden frame just inside the entrance. A mallet lies adjacent, with an invitation to strike the bell. Wherever we were in the chapel, every so often we heard a quiet gong tone resonating through the space as visitors gave the San José Bell a tap. So — there you have the legendary history of the San José Bell. On the other hand, there are those who think it much more likely that “August 9 of 1356” originally read “August 9 of 1856” … and that the 8 was changed to a 3 during the late 1800s as a means of attracting tourists. But where’s the fun, the mystery, in that? And, if that were the case, how could Señora Ortiz have purchased it in Vera Cruz in 1812? 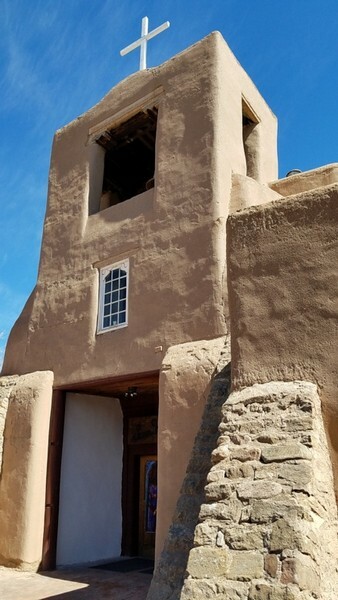 Today San Miguel presents a modest bell tower in which hangs a single small bell. The structure actually seems stylistically more appropriate and in better scale with the building than did the fancy three-tiered confection of the 19th century … and it’s definitely more storm-proof! Read our article about the history of San Miguel Chapel and the Spanish Colonial art that it holds. Get to know the oldest church in the US!